Hundreds take to Avenue A in solidarity with the Standing Rock Sioux against the Dakota Access Pipeline. Later that same evening, tempers flare at the second TFHS mascot (or is it logo?) forum. Full coverage of both events in this week’s Section A. 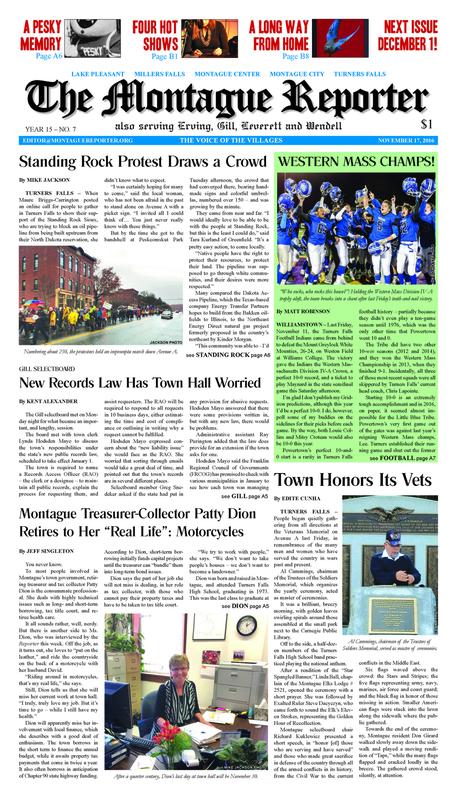 More from Montague: Vets are honored; town treasurer revs her engine and rides off into the sunset; we break down votes by precinct; and congrats to Western Mass champion TFHS Football. In Erving, the selectboard approves a slight tax increase and works towards a Green Communities grant. Gill frets over a new records law and takes care of business. Leverett welcomes a new police chief and celebrates the completion of one bridge (two more to go). Plus: letters and editorials address the post-election United States and the TFHS logo (or is it mascot?). MoRe: One hot week in TF for music lovers; one cold winter on tap, says NOAA. West Along the River welcomes unexpected November guests. An up-and-coming local author captivates in Greenfield. 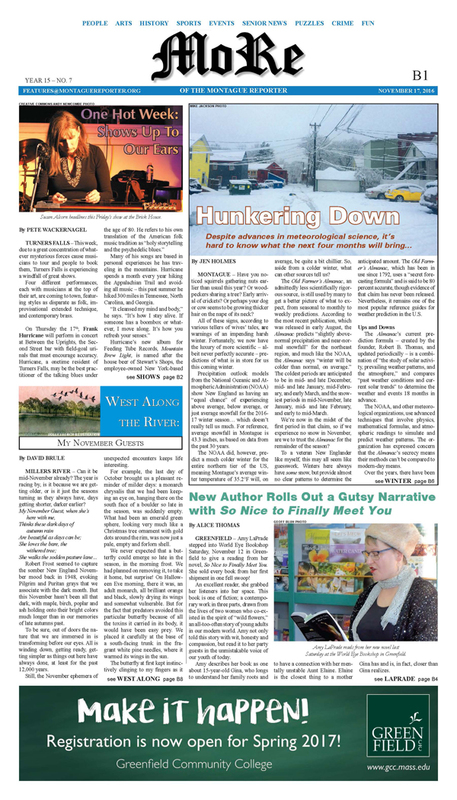 This month’s Poetry Page showcases another local author: Wendell poet Paul Redmond. Plus: tons of arts and events listings; the ever-popular Montague Cryptojam; Pet of the Week; police logs from Montague, Erving, and Gill; and much more. No paper on Thanksgiving, so make this one last! We’ll see you again on December 1.